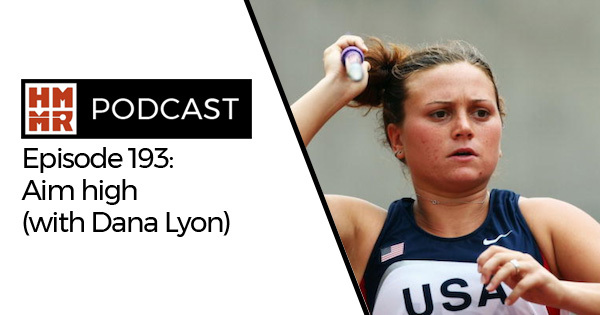 Dana Lyon is currently the javelin coach at the Air Force Academy, where she also oversees the strength and conditioning needs of select event groups and assists current US champion Kara Winger. As an athlete, she was the 2005 and 2006 NCAA champion in the javelin, as well as the 2007 US champion. She competed at the 2007 World Championships and took fourth place at the 2007 Pan American Games. 4:30 – Transitioning from athlete to airman to coach. 8:30 – Reflections on coaching Kara Winger. 24:45 – Lessons for discus throwers from the javelin. 40:30 – Developing the competitive mindset as a child. The site theme in March is throwing. Stay tuned for more new resources on all of the throwing events. You can also find an overview of our best throws content here. You can find Lyon on Instagram (@danapoundslyon) and Twitter (@USAjavLyon). You can read her full biography on the Air Force Academy webpage. We have had a few other javelin guests on the site. On Episode 170, Don Babbitt discussed results from the IAAF Biomechanics study on the javelin and other throwing events. Legend Steve Backley was a guest on last week’s GAINcast 156 and Olympic medalist Goldie Sayers on GAINcast 106. Former javelin thrower Justin St. Clair was also on Episode 105 to talk about the program he has set up at North Dakota State University. Javelin coach Terry McHugh also shared his javelin specific strength exercises on the site.